Cool and interesting boxes really capture my attention. It might be the shape, color or material that it's made of, but whatever it is I like them. Joe knows this weakness and gave me nicely made rectangular box that his wallet came in. It has been sitting on the corner of my drafting table for a ... while, waiting to be something. Then my daughter gave me a box full of random crafty things. Inside that box was the tiniest clipboard I'd ever seen. I picked it up and placed it in the cool box and bam! 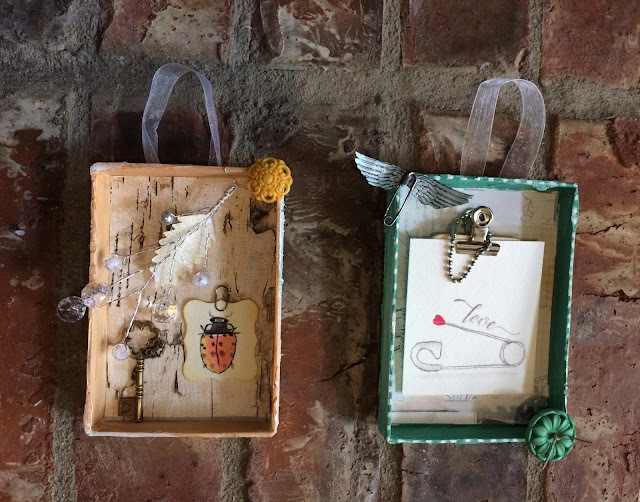 there was the thought to turn them into shadow boxes. 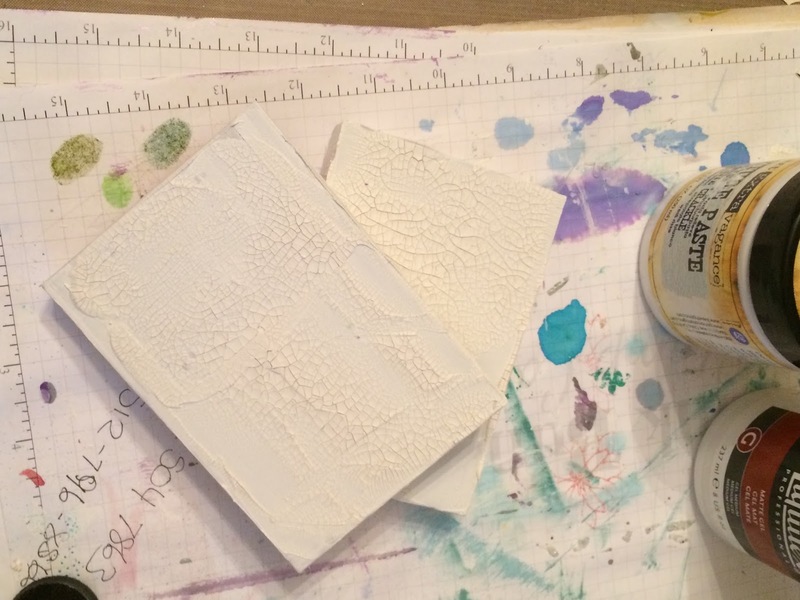 My first step is almost always the same: paint it with gesso. That's just what I did with the box top and bottom. When it dried, then I really slathered on some white crackle paste. I had to put it aside to dry all night, but the effects are so dramatic. It was time to add color. For one half of the box I painted it a warm orangey-yellow and the other one was a cool green. 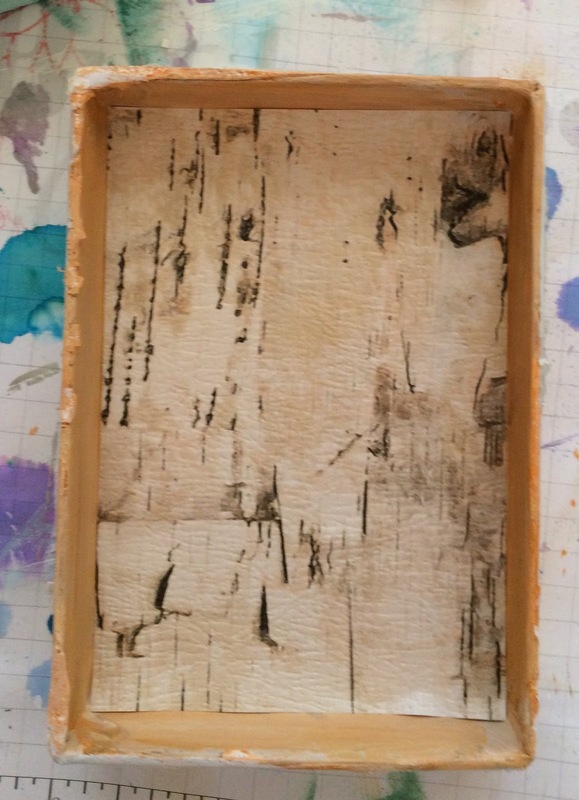 After they dried I added a few gesso streaks. Then for extra drama, I randomly smeared glass bead gel which added even more texture. This gel takes a bit to dry as well, but worth it! The sparkle is icy. 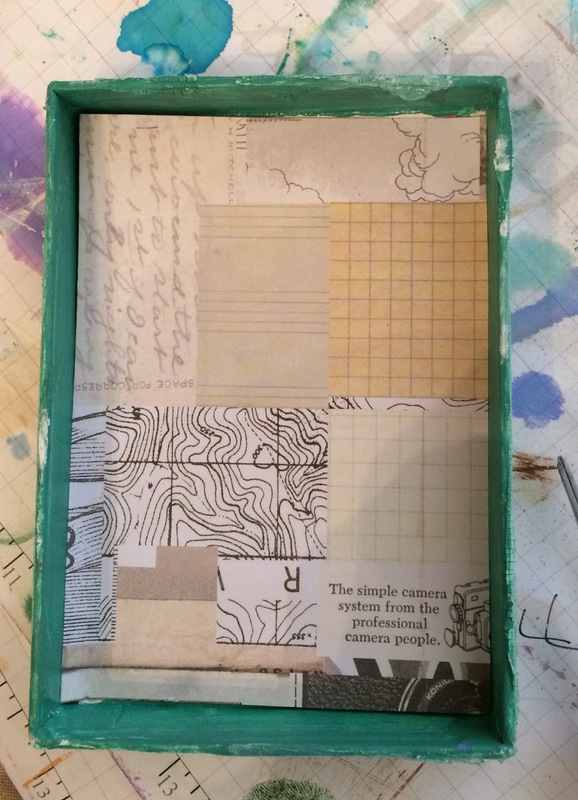 For the inside of the green box, I added some scrap paper from my scrap paper box. You know I feel so virtuous using up scrap paper (cue harp music). 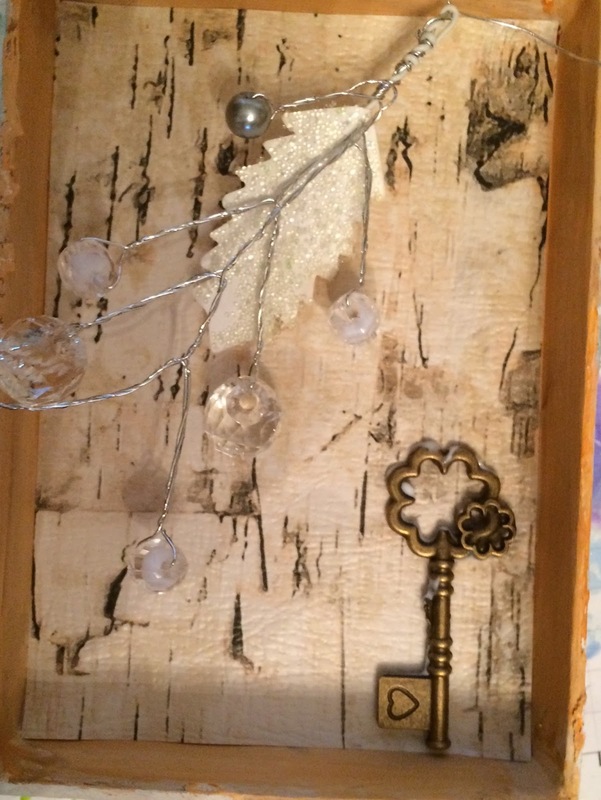 For inside of the green box I glued down a piece of wood grain wrapping paper. 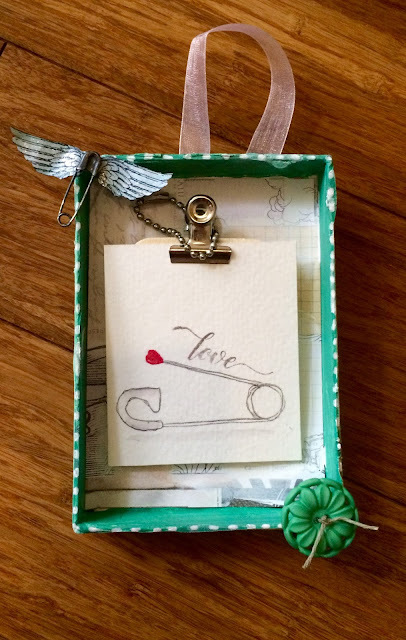 A few weeks back I watercolored/pencil sketch a safety pin for a friend and that what I wanted to put on the clipboard. You can find out more about the safety pin here. To make it stick I globbed on a bunch of gel medium and let it dry. The first attempt didn't have quite enough gel hence the globbing. I wanted to add a real safety pin on the corner. I put a small one in the corner. To me it was too silvery. Using black nickel paint, I dabbed it on and gently rubbed it in. While the pin dried, I downloaded some angel wings from Graphic Stock. I know, I know Pink Bunkadoo has so many downloadables. But I don't have wings. I need to take care of that. Anyways, colored my wings with my Tombow markers, then swiped some Wink of Stella shimmer over it, and finally I cut them out. I like to color before I cut because you don't have to stay in the lines and that's just faster. I glued the pin to the wings and the wings to the corner of the box all with gel medium. For fun, I added a cute button in the opposite corner. On the back I glued down some scrap ribbon with Ranger Glossy Accents for a serious sticking-on-and-never-falling-offness. Another button covered up the ribbon ends. 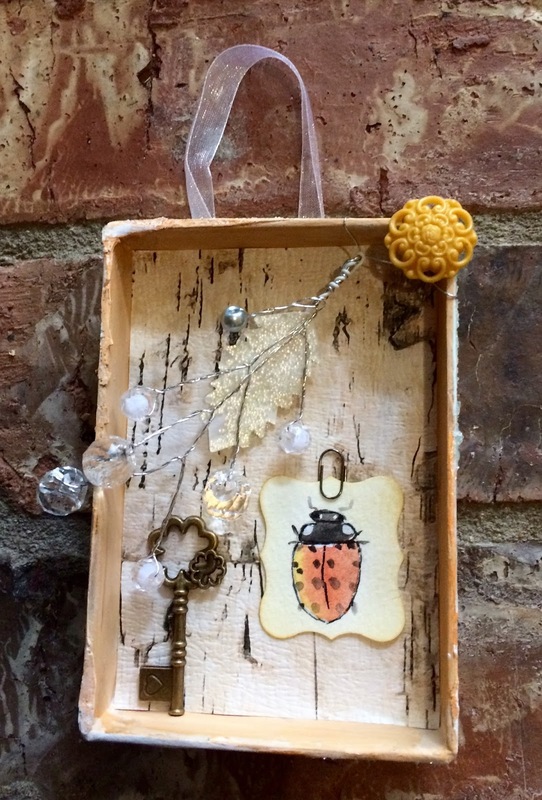 My hibernating ladybug inspired the next little shadow box. Click here for the Instagram picture. I had this bit of decoration from a Christmas cracker (I know I recycle or save a lot). I glued that diagonally on the box. Then I put a vintage skeleton key on the bottom left, because the ladybug is an invited guest and now has its own key. For fun I watercolored a simple ladybug, punch it out with a Stamping' Up punch, and went around the edges lightly with some Distress Brushed Corduroy ink. I attached a Tim Holtz tiny paper clip to the picture. Then I glued it down with a touch of gel medium. It was so stinking' cute. !Just like on the green shadow box, I added a cutie pie button. I attached the ribbon down the same way, too. Then buttons on the back were plain, flat unobtrusive button, but I felt like the raw ribbon ends needed covering. This ladybug shadow box is a keeper. I'm not sure where I'm going to put it. Maybe near the little ladybug? I have enjoyed shadow boxing! I highly recommend it. There are so many possibilities. I found a collection of antique drawers with years of different paints on them. Who knows? Another shadow box might be in my future. Materials: All materials are either Amazon affiliate links. I buy most of my crafting supplies there. Or they were recycled and scrap items.